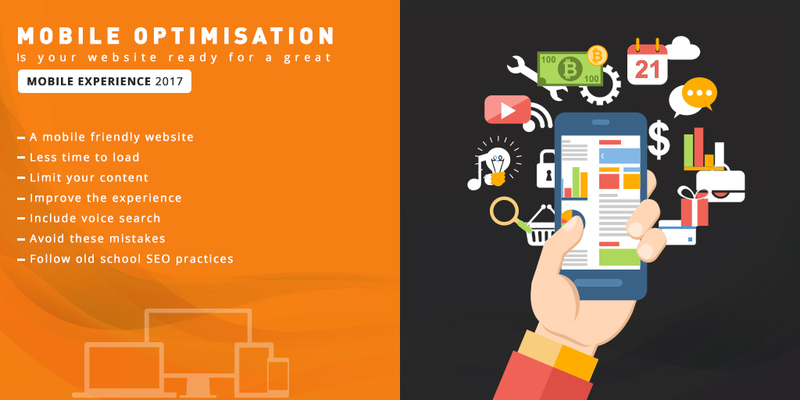 HomeSEO / SEMSearch Engine OptimizationMobile Optimisation; Is your website ready for a great mobile experience in 2017? The first thing we do when we wake up is to check our mobile phones. Mobiles have undoubtedly dominated our lives. We need it always while sitting, roaming, travelling or even sleeping to either Google something or to call and chat with somebody. Now in this scenario, if you overlook to build a mobile friendly website then you are losing a major business of yours. Here are some tips for optimising your site for mobile in 2017. A mobile friendly website: Building a mobile friendly website is the thing to do in first place. It is simple. You just have to adapt to responsive website designing method. A responsive designing method is the one which helps the website to adapt to any screen size (tablet, laptop, smartphone, smart TV etc) so that it can be easily viewed. Here, the users don’t have to scroll the screen again and again to see the entire page. Less time to load: If a user is accessing your website and it takes more than 2 seconds to load then for sure you losing him to your competitor. So, be careful while constructing and creating your web pages. There should not be too many images or late sized images because excess code bloat can also slow down the loading time of your website. You must minify coding, CSS and optimise the images. This bit will also help to have better performance of the site. Limit your content: Scrolling back and forth repeatedly to reach to the main part really becomes annoying on the mobile phone. Agreed, you might have some longer pages on your website but you need to rework it so that it becomes digestible on mobile. Optimising the content for mobile is really important so that readers can easily go through the highlights of your offerings. Improve the experience: Well, having a responsive website or limiting your content is not enough for a great mobile experience of your website. Your calls to action need to be mobile friendly, your navigation needs to be easy, the user experience should be engaging an excellent. Consider all such metrics like the bounce rate or the time spent by the user on the different sections of your site so that you can provide an easily accessible website and a rich experience to your users. Include voice search: With smartest of phones in hand, people are now asking their queries in the voice rather than typing them and in order to have a mobile friendly website you just can’t skip this point. The potential customers who are not aware of your website can also come across it if your content has the relevant answers to their queries. People are now looking for concise and accurate question answer type content so while optimising your site for mobile, really put in some obvious and solid Q&A material in your content. Avoid these mistakes: If you actually want your users to have a great mobile experience of your website then avoid these common mistakes which even Google has suggested. Some sites serve content to desktop users accessing a URL but show an error page to mobile users (404 errors). Some videos or content are not playable on mobile devices. They especially require other software to play it. Blocking CSS, JS and image files. You must not have separate mobile URLs and even if you have then your desktop URLs should redirect you to the correct mobile URL. Redirecting to other pages really lessens the interest of the user. Follow old school SEO practices: A strong title and a meta description always grab a readers attention and when it comes to mobile optimisation, you can always reserve 55-70 characters for title and 130 to 160 characters for meta description. Thus, the shorter, simpler and SEO oriented it is the better it would be.